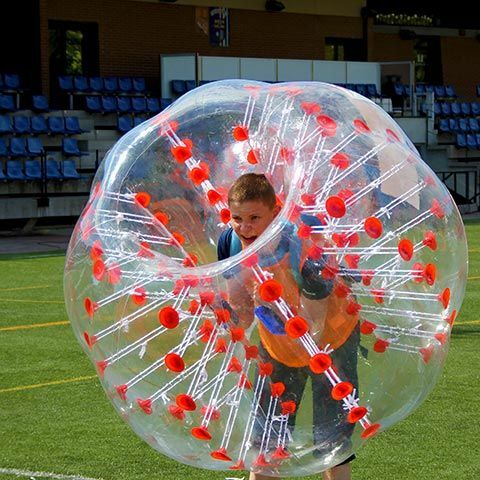 Bubble Football is an incredibly fun activity for all kinds of groups! 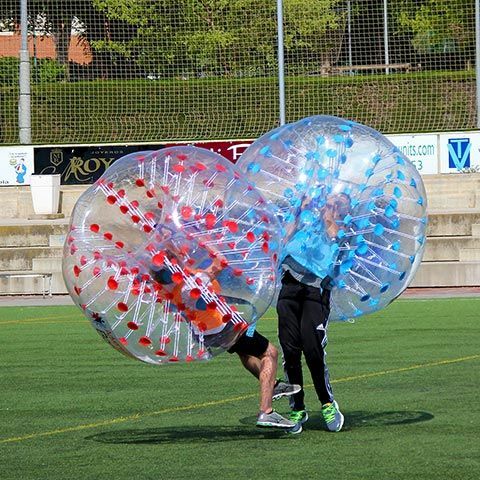 If you are a student group visiting Barcelona, Bubble Football / Bubble Soccer is perfect for you! Incredibly fun for everyone! Are you a Corporate Group looking for teambuilding activities and some great laughs? 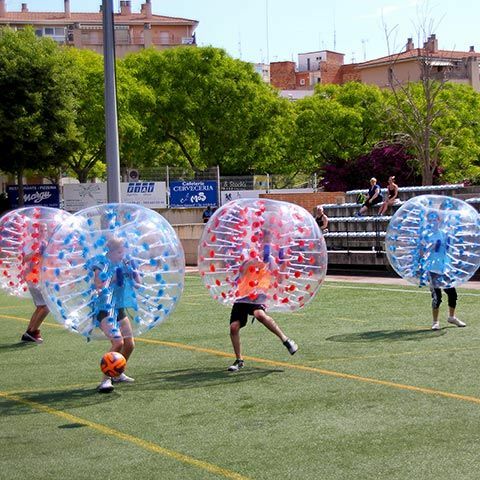 Try Bubble Football / Bubble Soccer! If you are a Sports Club that enjoys competing and want to try the funniest sport ever, sign up for Bubble Football! 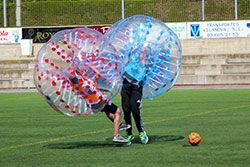 There are several other fun ways to play bubble football in addition to the classic Bubble Football match. We can offer you a variety of great game types, which you can combine with a regular bubble football match. This is Bubble Football inspired by American Football. Participants are divided into two teams. Each team chooses one captain, who will play the role of the ball in American Football. The captain will try to get inside the home circle of the other team, while the rest of his team will try to defend him/her. The opposing team will do their best to prevent the captain of the other team to enter their home circle. The winning team is the one that in the least amount of time, are able to do a "touch down" inside the home circle of the other team. This is the bubble version of the good old ten-pin bowling. One player is the bowling bowl, while the rest of the players will act as cones. The cones are placed in a diamond formation. The bowling ball will then run as fast as he/she can towards the cones. The objective is to bounce as many of the cones as he possibly can. Then we swap bowling balls so everybody gets to try being the bowling ball. The winner is the one that bounces the most cones in two attempts. 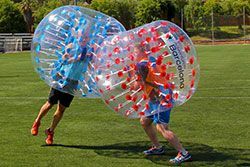 This version of Bubble Football is a football duel. First, we choose one player to be the goalkeeper. Then both teams stand on a line at the midfield of the pitch. We place the ball a few feet in front of the players. When the referee blows his whistle, one player from each team run towards the ball, tries to take the ball and score a goal. Everybody gets to try. The team with the most goals wins the competition. You probably know this game from school, only this time you will be wearing huge plastic bubbles. One participant stands in the middle of the field, while the rest of the participants stand on one side of the field. When the referee blows his whistle, everybody will try to reach the other side without being caught by the one in the middle. If you are caught, you will join the one in the middle and try to catch the others. The last bubble to be caught is the winner of the competition. This is Sumo wrestling with bubbles. First, we set up a Sumo ring, and choose to bubble wrestlers. The bubble wrestlers will try to knock their opponent over or push him/her out of the sumo ring. We try to divide you in equal pairs so we get good matches. The winner of each match goes on to the next round. In the end, we have a Bubble Wrestling final and winner of the tournament. Most of you have probably heard about "Last Man Standing", Last Bubble Standing is a very similar game. All participating bubbles are gathered within a defined area. When the referee blows his whistle, you try to knock over all the other bubbles, without falling yourself. If your bubble touches the ground, you are out of the competition. If you run outside the defined area, you are also out of the competition. The Last Bubble Standing is the winner of the competition. 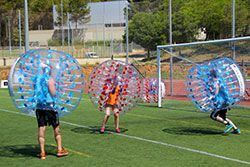 This bubble football game is very similar to "Last Bubble Standing", except this time we divide into teams. Two teams are gathered within a defined area. When the referee blows his whistle, you try to knock over all the bubbles on the opposing team, without falling yourself. If your bubble touches the ground, you are out of the competition. If you run outside the defined area, you are also out of the competition. The Last Bubble Team standing is the winner of the competition. Price from €15,- per person - Click here to book! Minimum of 8 participants. No upper limit to number of participants. 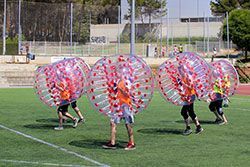 You are protected by your bubble, just start running and bump into your competitors. Not just a football match, you can also try "Last Man Standing", "American Football" and other fun games. Bubble Football is awesome! The perfect activity for a group who wants some fun and some laughs!